Blanching vegetables is not hard, yet many people shy away from it. Blanching is necessary because it stops the enzyme activity that will cause the vegetable to age while it’s in the freezer or after its been dehydrated…something we don’t want to happen. So, this simple process is necessary to help preserve our food, whether we’re freezing or dehydrating it. See the video demonstration below on how to blanch broccoli. Written instructions are below the video. Wash and cut your fresh broccoli into pieces no larger than 1-1/2 inches long or in diameter. Meanwhile, put a large pot of water on the stove to boil. When the water comes to a rolling boil, place the prepared broccoli in the boiling water and immediately set the timer for 3 minutes. 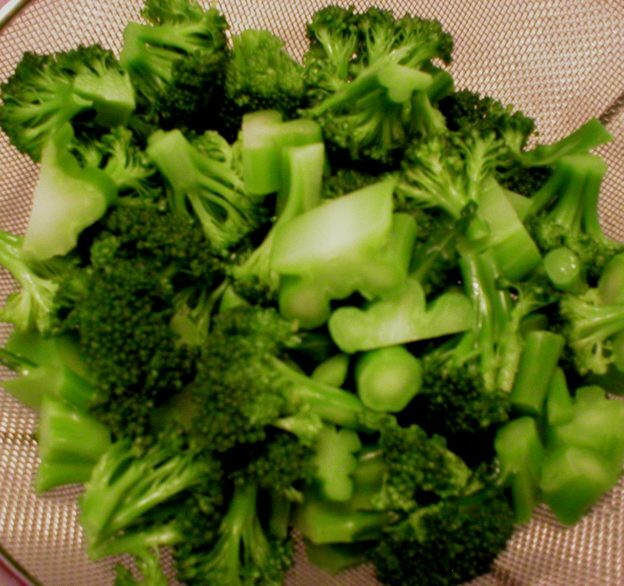 While the broccoli is boiling, prepare a large bowl of water with a lot of ice in it. As soon as the 3 minutes of boiling time is up, immediately transfer the broccoli into the ice water. Leave the vegetables there to chill for at least 3 minutes. Then drain the broccoli well and place in freezer bags or containers. Label them with the date they are placed in the freezer. If placing the broccoli in bags, be sure to remove as much air as possible from the bags, and lay the bags flat in the freezer, spreading the broccoli through the bag as much as possible. This will help it to freeze faster and prevent big clumps of frozen vegetables that are hard to break up. Broccoli prepared this way will keep in the freezer for about 12 months. If you plan to dehydrate your broccoli, the preparation method is the same…wash, cut, boil, and cool down as described above. Follow the dehydrator manufacturer’s instructions on the time and temperature for dehydrating in your machine. Broccoli prepared in this way (lightly cooked) can also be eaten in salads and incorporated into other freshly cooked dishes. Enjoy! This entry was posted in Food and tagged blanch broccoli, blanch broccoli for dehydrating, blanch fresh vegetables, how to blanch broccoli on February 9, 2019 by Judi.